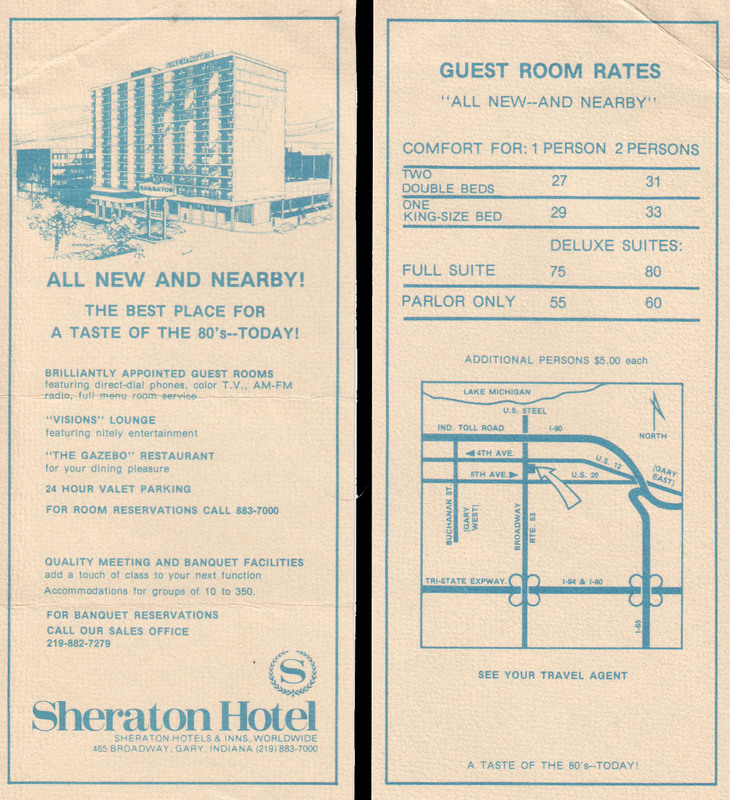 “The Best Place For A Taste Of The 80’s – TODAY!” shouts the brochure for the defunct Sheraton Gary. Existing in a time warp since it closed two decades ago, it is still the best place in town for a taste of the 80’s today. It was with high hopes that the 135 room hotel opened on December 18, 1978 complete with 2 luxury suites (the “Peach” and the “Lime” with matching 70’s decorations), a lounge, a restaurant and meeting rooms for up to 350 people. Attached to a new 300-car parking deck, it was the centerpiece of an urban redevelopment effort launched by Mayor Richard G. Hatcher. Mayor Hatcher was first elected in 1967, and worked to dramatically cut the air pollution turned out by the giant nearby US Steel factory to which Gary owes its existence. Gary was hit extremely hard by white flight to the suburbs in the 1960s. The city’s core population dropped as developers created new housing and shopping centers in Merrillville, Schererville and Hobart to the south. By 1990 over 80% of the city residents were African-American. Seeking to redevelop the city center, Hatcher embarked upon a massive public building campaign, financially assisted by the Federal government. Plans called for a new convention center, a new sports complex and a downtown hotel to replace the Gary Holiday Inn, which opened in 1969 and closed in 1975. The Sheraton Gary today. The building now serves as a platform for a communication tower perched on its roof. A group of investors calling themselves Steel Plaza, Inc. met to set up the funding for the hotel. They were regular businessmen – an attorney, an accountant, the owner of a car dealership – who seemed less concerned about making money than in helping their city. 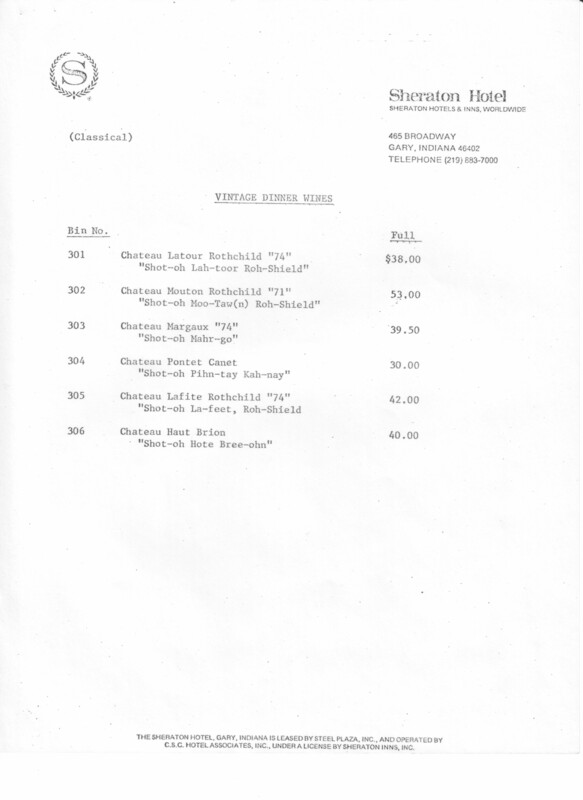 They brought in another corporation, CSC Hotel Associates, to manage the property, and the Sheraton Corporation granted them a franchise. By all accounts there was much excitement about the opening. A live act called “The Independent Movement” was the first entertainment in the “Visions Lounge”, which had the typical “mirrors everywhere” decor of the era. 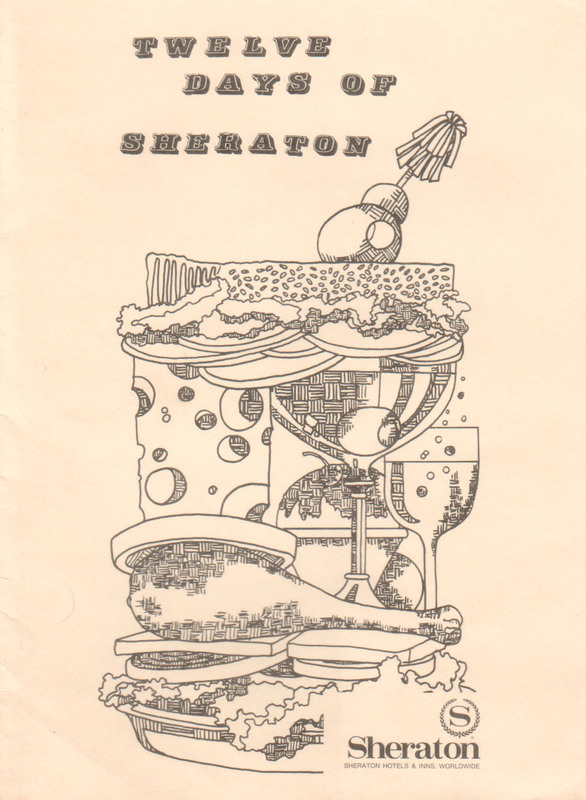 The hotel hosted the “Twelve Days of Sheraton” during which the Gazebo Restaurant added a new entrée each day to the menu. However, it wasn’t long before trouble started. First, with little to do in downtown Gary, there were few tourists. The builders of the new Genesis Convention Center, designed to connect directly to the hotel, delayed and dramatically downsized the project. Many of the residents, stricken by poverty, could not afford to put up their relatives in the hotel when they came to visit. Even freeway traffic didn’t help – the Indiana Toll Road that runs past the north side of the hotel was lightly traveled in comparison to the toll-free Borman Expressway many miles to the south. City employees use the driveway under the tattered awning of the hotel as extra parking. 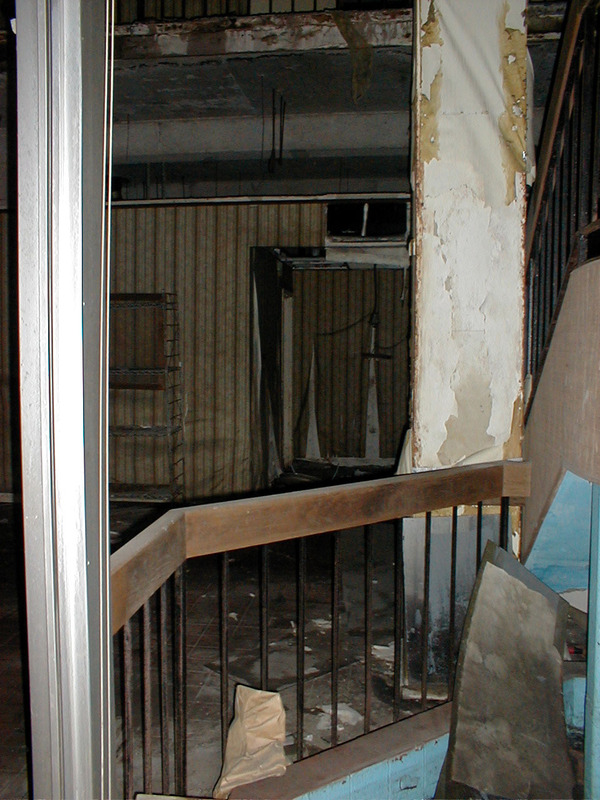 Front door of the hotel boarded over with grey plywood. Note the fake painted door handles. 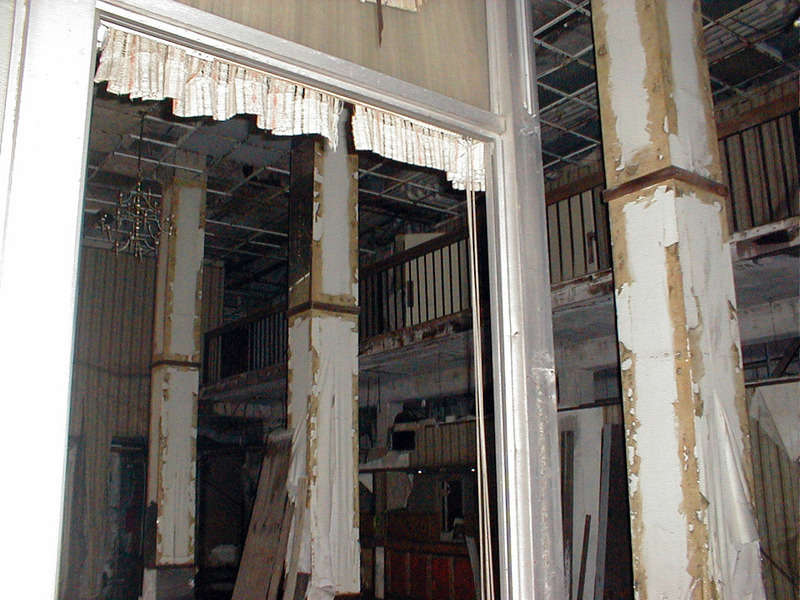 Just one year after the hotel opened, there were fewer than 40 businesses remaining in Gary. 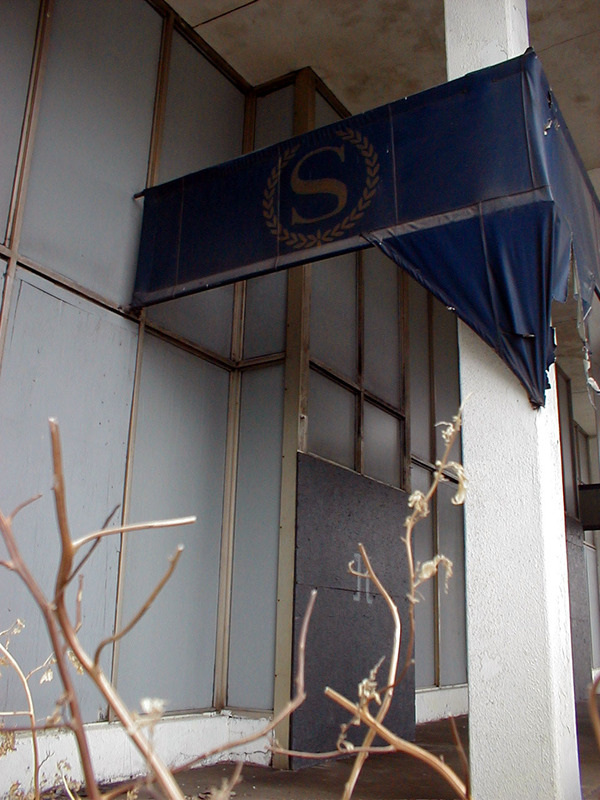 Without an economic base to support it, the hotel went bankrupt. 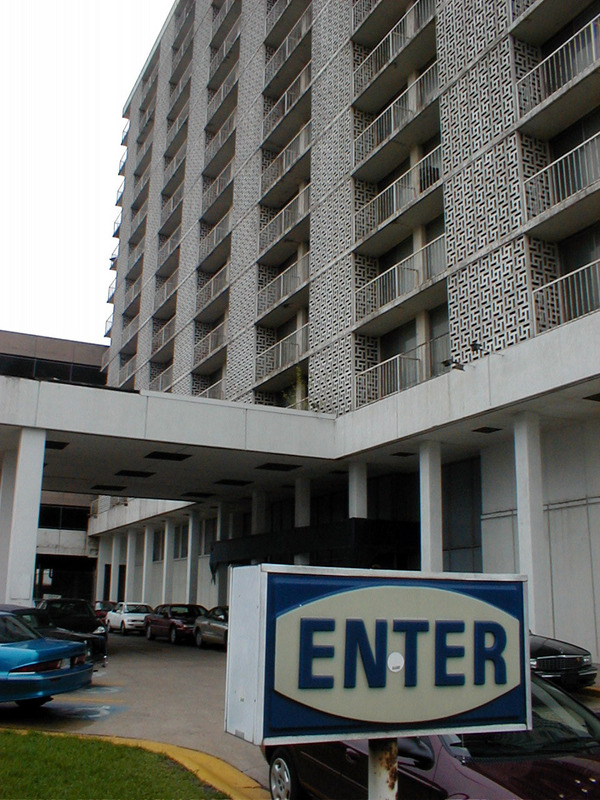 The city began paying the hotel’s utility bills to keep it open for a few more years. By 1983 the city itself could no longer pay its utility bills, and had to lay off almost 400 city employees. 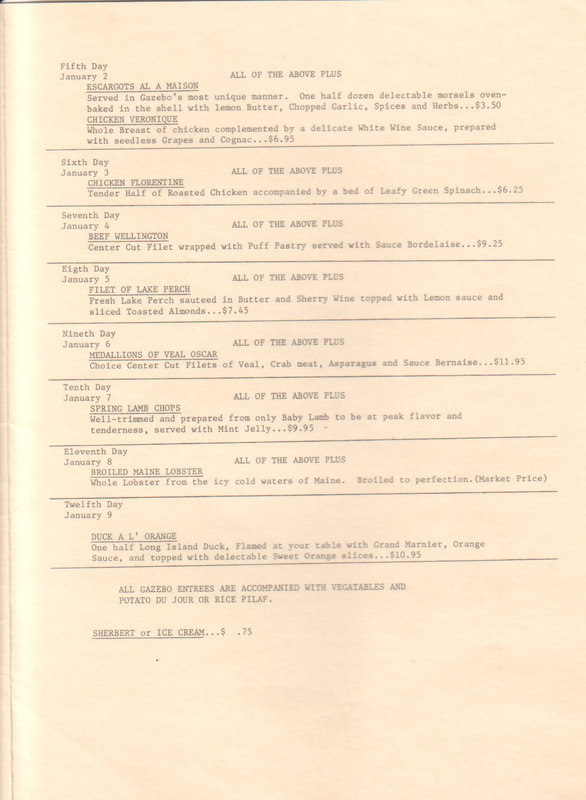 The “Twelve Days of Sheraton” program menu pages. 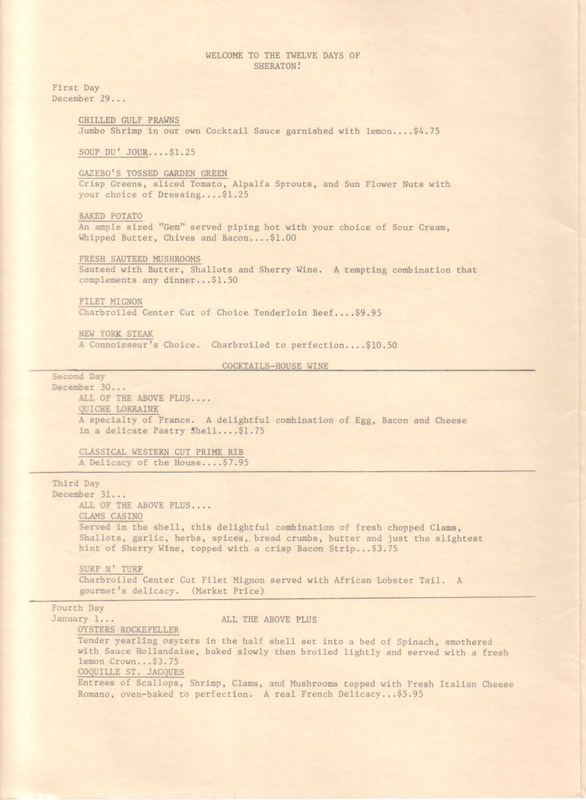 It was a program to roll out new dishes one at a time. 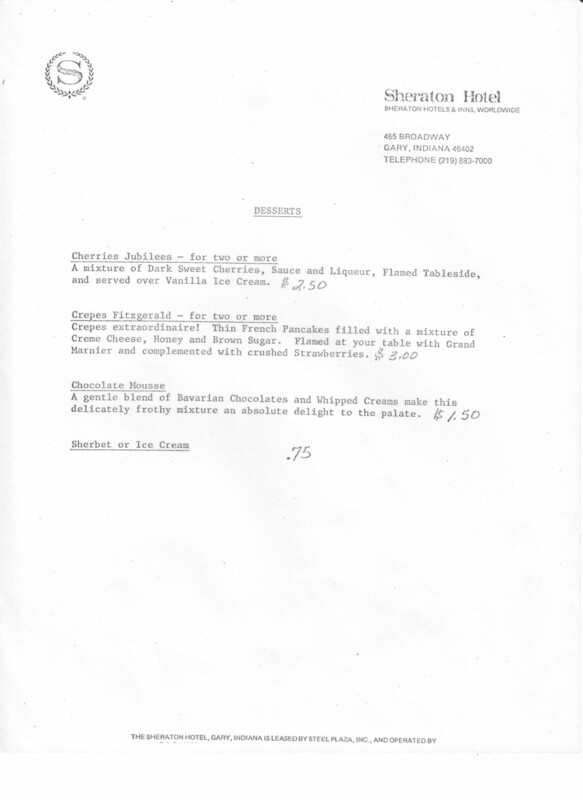 All were served in the “Gazebo” – the hotel’s restaurant. Note the phonetic pronunciations of all of the wines, maybe for room service. It’s a miracle the hotel didn’t burn down from all the flambe. 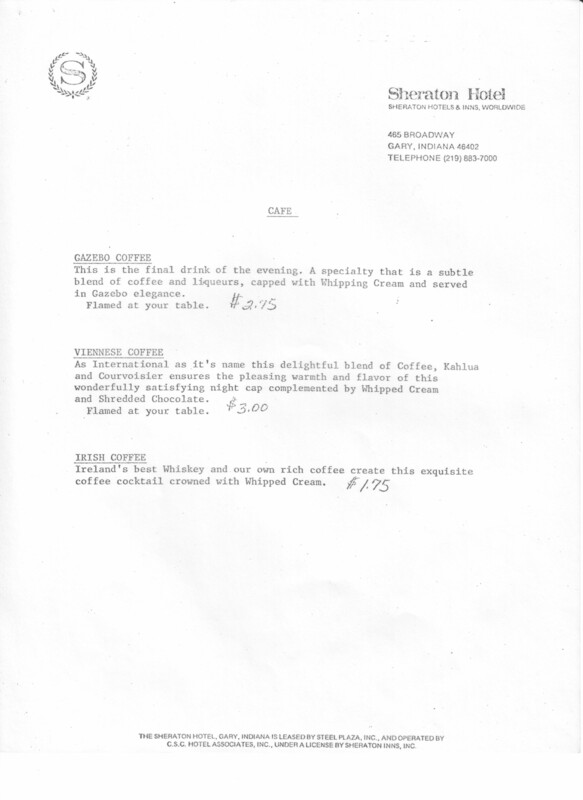 The exact date of the hotel’s closing is difficult to pin down – no record in the newspaper exists. Most accounts place it in 1984 or 1985, but it could have closed months earlier. Thus a symbol of failed urban redevelopment overshadows the Gary City Hall sitting only a few steps away. The mayor and the city council park their cars in what once was the hotel’s shared front parking lot. 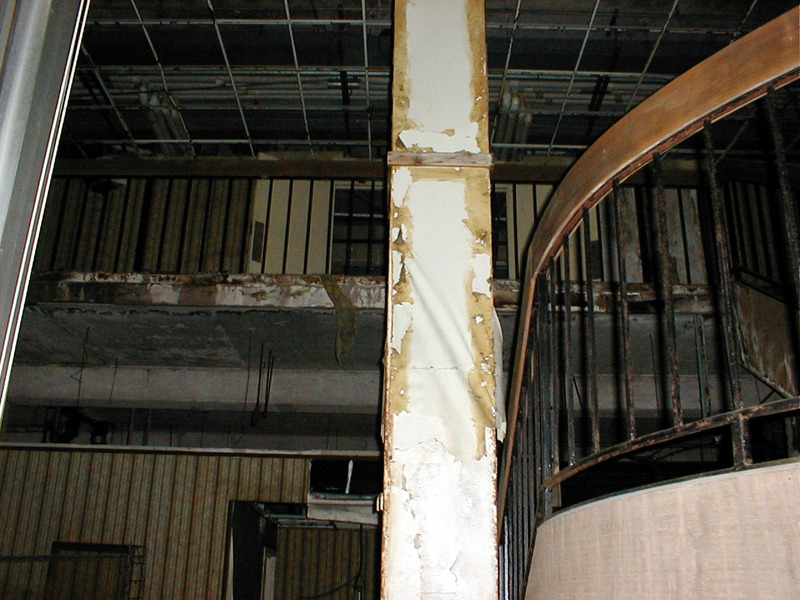 The severely deteriorated lobby of the Sheraton Gary today. Chandeliers still hang from the ceiling. Most of the ceiling tiles have disintegrated in the heat and humidity and have smashed on the floor. Horrible yellow, green and white wallpaper hangs in curled sheets from the wall, the glue loosened with age. A curved staircase leads to the mezzanine level meeting rooms. 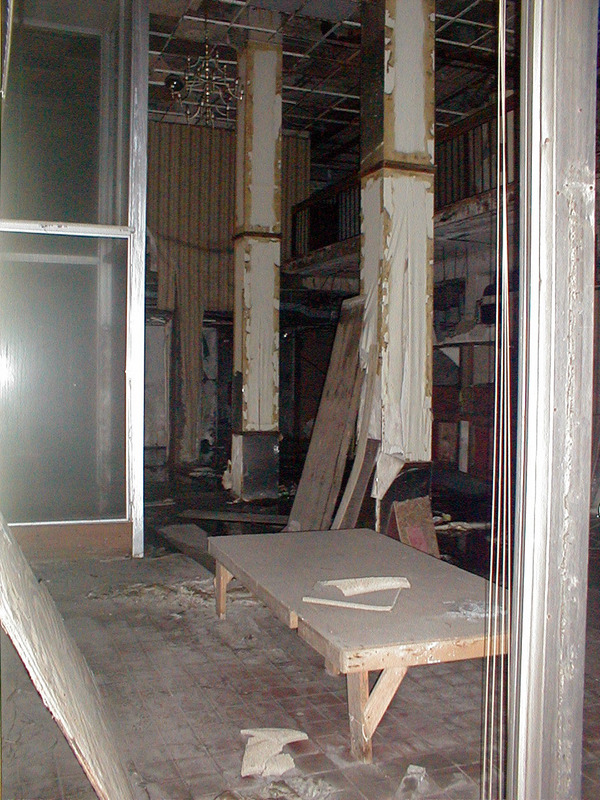 The red-paneled front desk is partially visible. The parking garage attached to the hotel is also closed – though it might benefit the city to reopen it as the lot in front of city hall is too small and cars routinely use the front driveway of the hotel as extra parking. 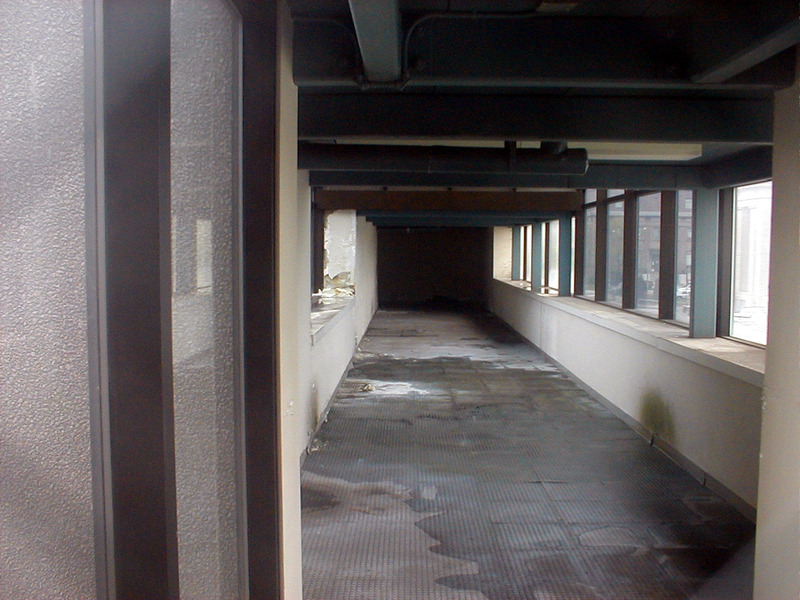 On either end of the hotel are skywalks – a locked one that connects to the Sports Complex next door, and a tube over Broadway that connects to nothing but a staircase as the Convention Center is smaller than intended. 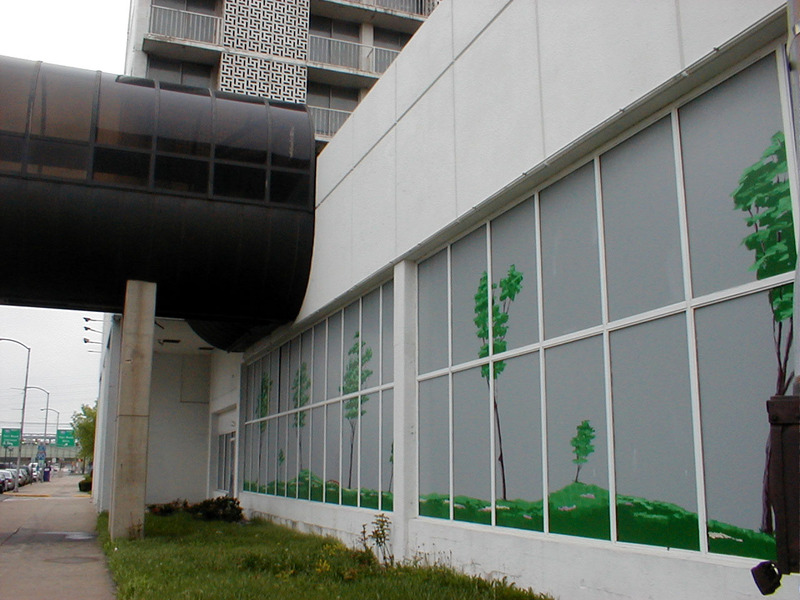 Boards cover windows, painted to look like windows. 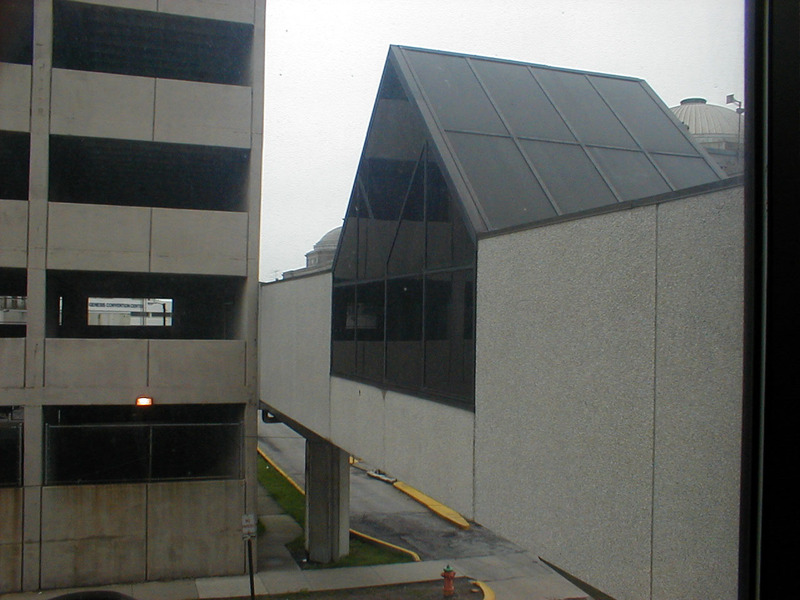 Skybridge connecting the garage to the sport center. 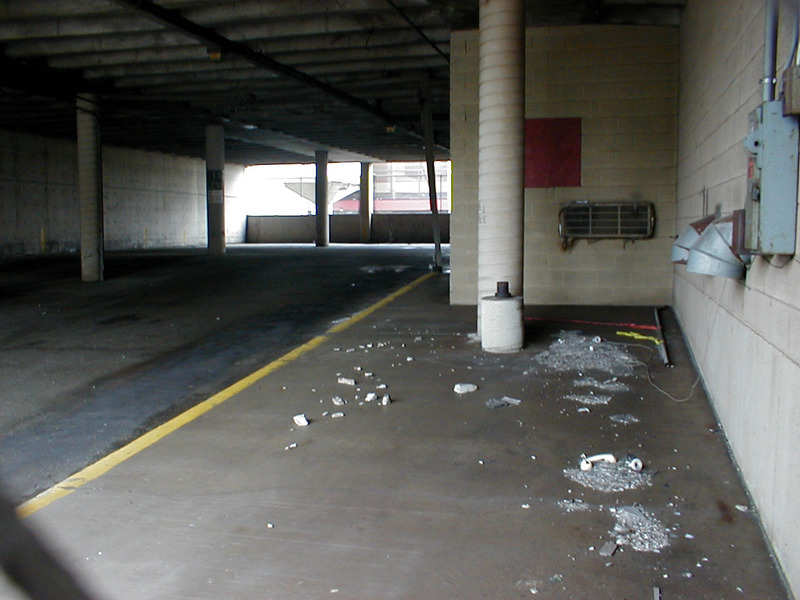 The entrance ramp to the closed garage. Not safe to park on. Skybridge over Broadway connecting the hotel to nothing. The city hired an outside appraiser to estimate the value of the building for a sale – but they found that the property actually had a negative value, meaning the owners would have to pay someone to take it off their hands. Instead the City of Gary took over the property. In the end, all the building and grand plans did little to stem the tide. Between the 1980 and 1990 census, one-quarter of the cities residents left, more than any other city in the United States. 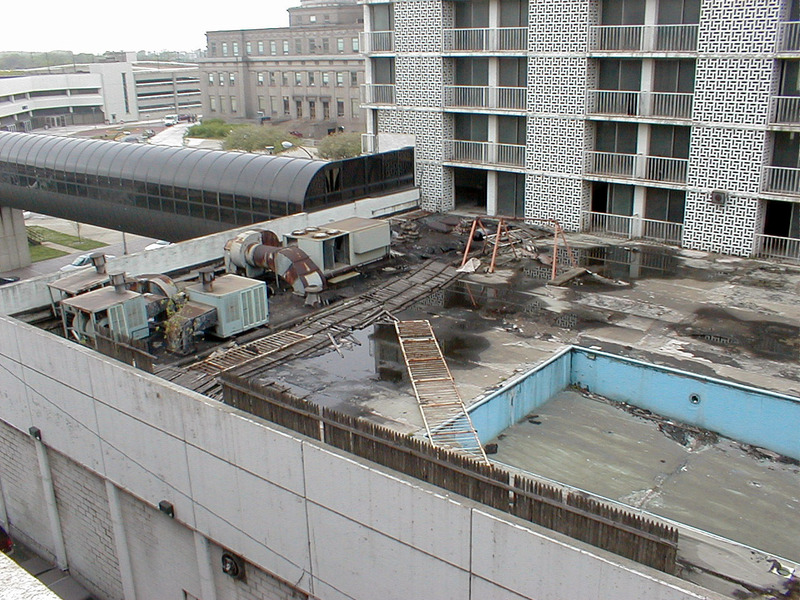 The rooftop swimming pool, with only a broken swing set and railing left. 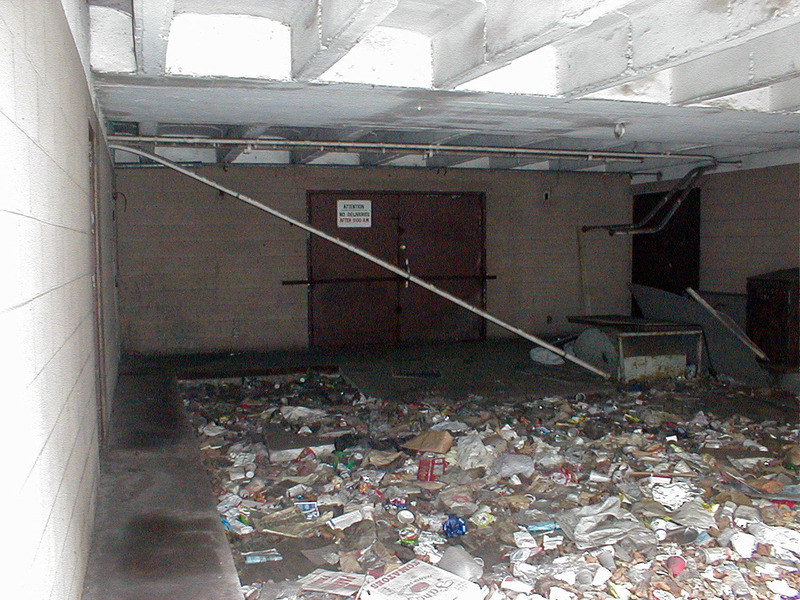 The trash-strewn loading dock. Not even vagrants will take refuge here. 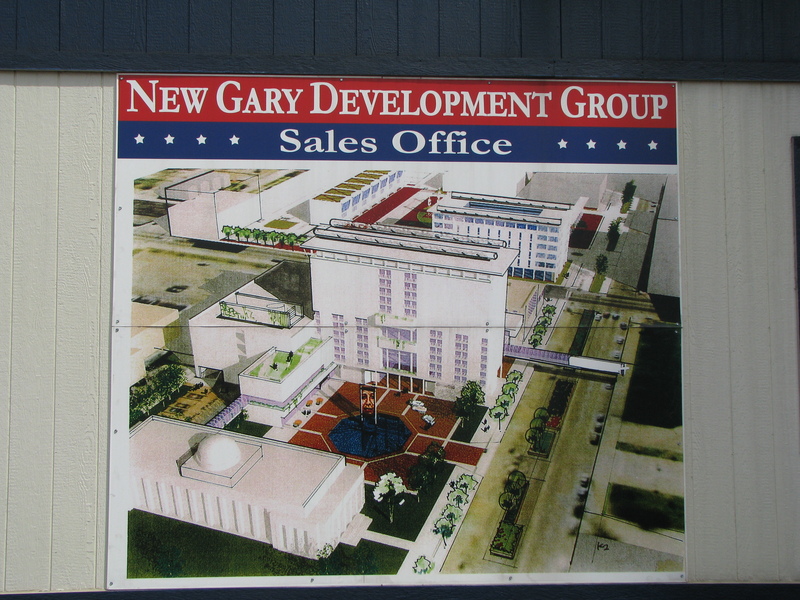 By the late 1990s, however, Gary had a new mayor and a new outlook. First, the Indiana State Legislature approved riverboat gambling, and two casinos, one led by Donald Trump, moved into “Buffington Harbor” – really just the Lake Michigan shoreline of Gary. As part of the agreement to build there. Trump’s organization agreed to several financial concessions to the city, including the promise to invest $10 million in renovations to reopen the Sheraton Gary. A reborn Pan Am Airlines began regular passenger service out of the Gary Airport. 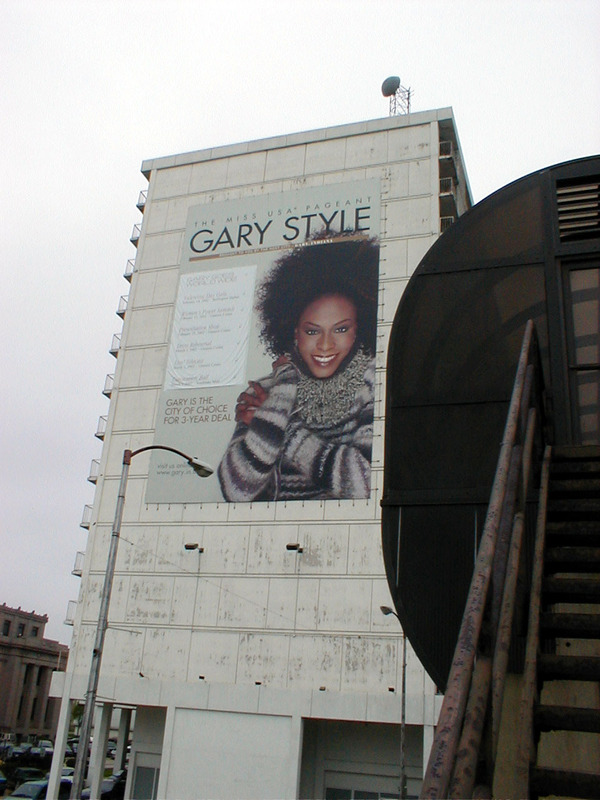 The “Gary Style” banner on the side of the hotel facing the Genesis Convention Center. A second banner with the 2002 event dates covers the original dates. In 2001 Trump steered another of his affiliate companies to bring the Miss USA pageant to Gary’s Genesis Convention Center for three years. Instead of spending the money on the hotel – which might compete with his own recently completed hotel next to the riverboat casinos – he convinced the city to allow him to make improvements to the Convention Center instead. The only adjustment to the hotel was a $30,000 banner proclaiming “Gary Style” to the world on the side of the hotel facing the Convention Center. Guests of the pageant, including host William Shatner, stayed at the casino’s hotel. Ironically, organizers decided to hold the Coronation Ball at Southlake Mall in Hobart – the very development that led to the rapid decline of Gary’s retail infrastructure in the 1970s. 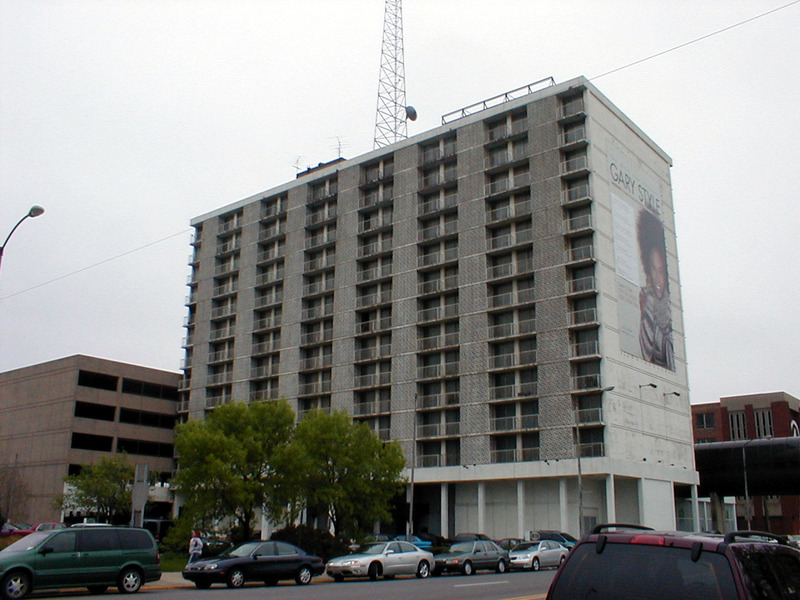 Rumors of reuse for the building occasionally float though the newspaper, most recently a plan to convert the building into a Hilton Garden Inn. But just like in the late 1970s, you can’t build a hotel where no one wants to stay. 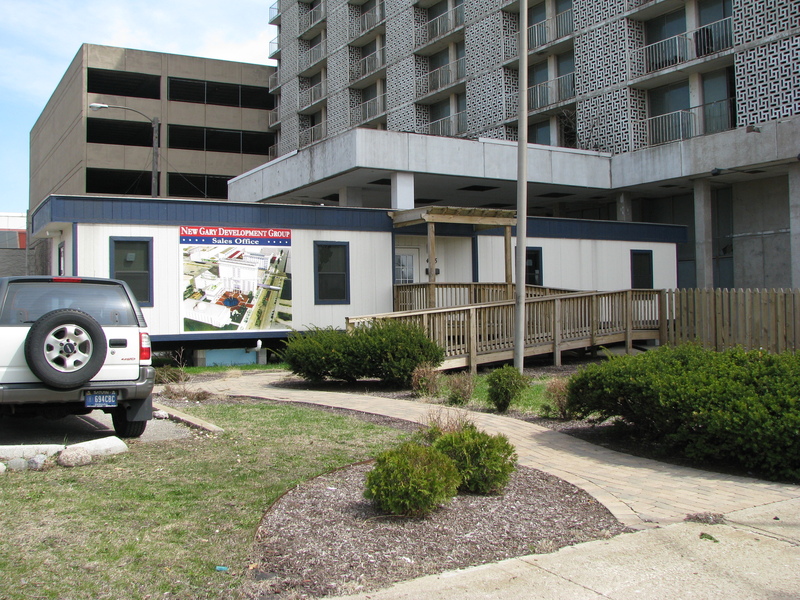 As of April 2009, a portable trailer now sits tucked under the awning of the hotel, promoting a fresh plan for redevelopment. On the side is a large artist’s rendering of a new center plaza featuring the Sheraton building. The Trump casino went bankrupt (despite the Miss USA pageant), and Donald sold it to the neighboring Majestic Star Casino in 2005.